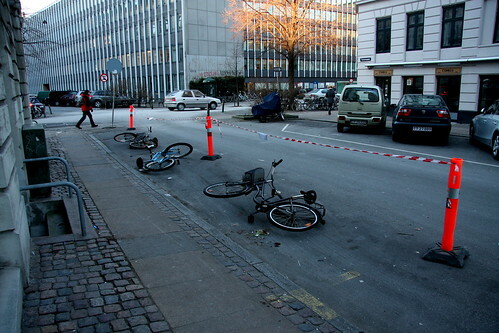 Typical Copenhagen. Someone needs to reserve this stretch of parking spots. For whatever reason, be it the arrival of a moving van or a temporary container. Who knows. They used the traditional tape and orange pylons but this is often hardly a deterrent for motorists. I've tried this before and all too often a motorist will disregard your attempt to reserve the spot. Finding parking is difficult in the centre of Copenhagen. It's frightfully expensive and the City removes 2-3% of all parking street-level parking each year, using the space for bicycle infrastructure or public spaces in general, be it trees, benches, what have you. The solution above is simple. Mark off the space you need to reserve and then use some of those bicycles leaning against a building nearby, laying them down ever so nice. A motorist may nudge a pylon out of the way but they will hardly hop out of their car to move a bicycle. Case closed. Problem solved. Copenhagen style.